Nearly 150 volunteers rolled up their sleeves and participated in the City’s first Community Day of Service on Saturday, February 25. At March Field Park, volunteers gave the Community Center a fresh coat of paint. One of the park’s baseball fields also received some TLC with a coat of new paint for the dugouts and the scorer’s booth. Volunteers also made sure the park was litter free. Paint was generously donated by Dunn Edwards. Volunteers also cleaned up Hidden Springs Park by clearing litter and weeds, and even worked to fill in dirt that had eroded during the recent rainstorms. A total of 15,300 square feet of trail was cleared of weeds and graded by our hard working volunteers, Fifty bags of debris was also removed from the park. More than 80 people took the opportunity to get rid of unwanted appliances, furniture and other bulky items as part of the event’s Bulky Waste Clean Up courtesy of Waste Management and the City’s Public Works Department. The Community Day of Service was made possible by a grant provided by the Western Regional Council of Governments and generous donations and partnerships with Waste Management, Eastern Municipal Water District, and Dunn Edwards. 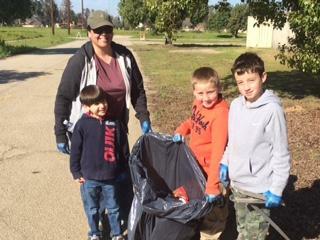 Thank you to all of the volunteers who took time out of their weekend to help keep Moreno Valley beautiful. 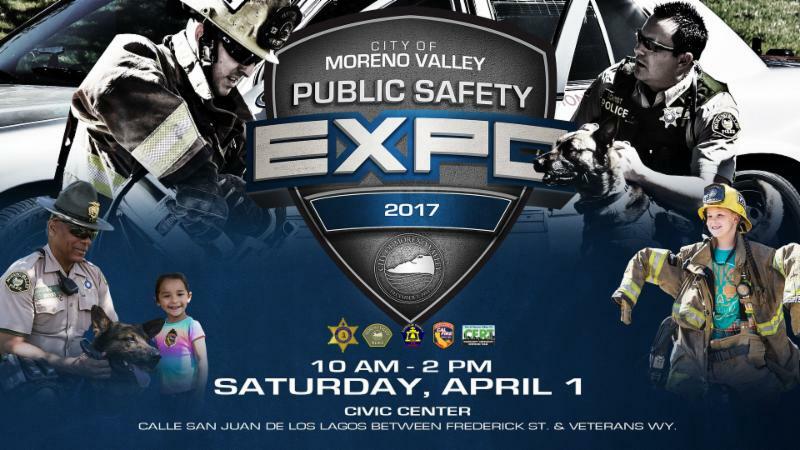 The 2017 Public Safety Expo is just around the corner. This is your chance to see Moreno Valley’s bravest police officers and firefighters in action. Come see what it takes for our heroes to keep us safe every day! Join us at the Moreno Valley Civic Center on April 1 from 10 a.m. to 2 p.m. to see Moreno Valley’s finest show off their skills including live demonstrations with police dogs, the Jaws of Life and much more. Bring the entire family to this family-friendly event to see police and fire equipment up close, investigate career opportunities and learn more about how our law enforcement and fire personnel do their jobs. Come for the demonstrations and stay for the food, music and giveaways. The City of Moreno Valley is proud to announce its Employment Resource Center Relaunch took home a first place finish at the Inland Empire Economic Partnership’s (IEEP) Fourth Annual Turning Red Tape to Red Carpet Awards. 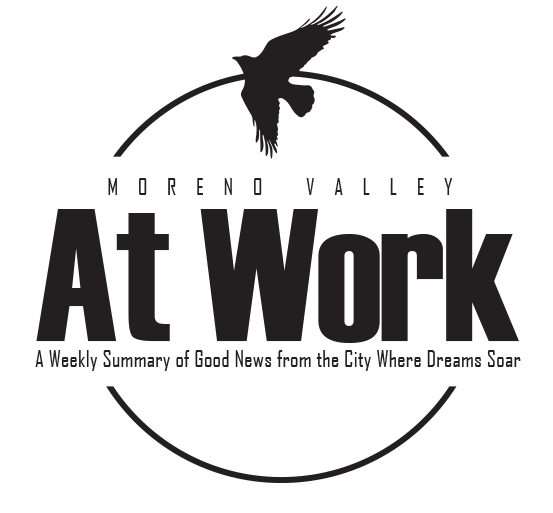 The Cooperation Among Cities, Counties or Agencies award was given to the City of Moreno Valley for its efforts to modernize the Employment Resource Center (ERC) to better serve employers, workforce and economic development professionals and job seekers. The City was also named IEEP’s runner-up for its Sustainability and Green Development award for ALDI’s Sustainable LEED Gold Certified Moreno Valley Headquarters and Distribution Center, and a finalist for the Business Retention & Expansion award for its Momentum MoVal Business Visitation Program. The IEEP’s Turning Red Tape into Red Carpet event honors agencies that have developed innovative ways to avoid bureaucratic red tape for the betterment of local economies and communities. 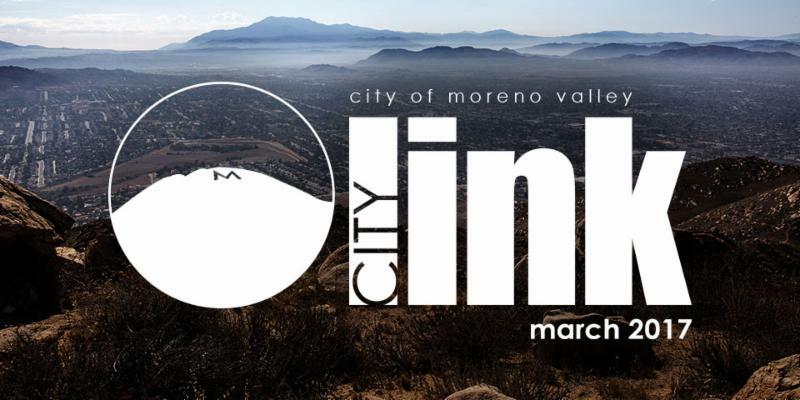 "The City of Moreno Valley is committed to innovating ways to make it easy for companies to do business in our City and for job seekers to find the right opportunities to get back to work," said Moreno Valley Mayor Yxstian Gutierrez. "Cutting through the red tape and rolling out the red carpet strengthens the regional economy and puts people back to work." 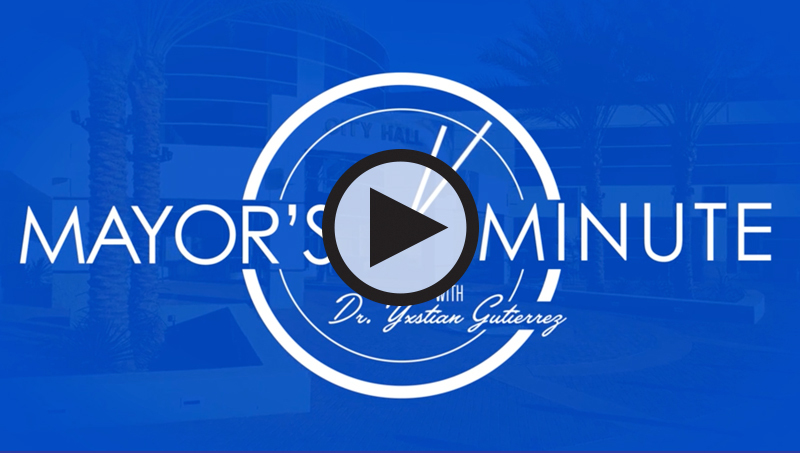 The City of Moreno Valley used a $53,000 grant from the Western Regional Council of Governments to give the ERC a complete facelift. Since opening its doors in 2009, the ERC has helped lower the unemployment rate, create jobs and raise the quality of life for Moreno Valley and County residents. In 2016, staff embarked on the ERC Relaunch program that included an upgraded computer lab, new paint, carpet and window treatments, a faster internet connection and new computer operating system and software. For employers, ERC staff members help with candidate screenings, job fairs, job recruitment postings, and much more. The ERC is located at 12625 Frederick Street, Suite K-3, in the TownGate Center and is open Monday-Thursday from 8:00 a.m. to 5:00 p.m. For more information, residents and employers are encouraged to call 951.413.3920 or email erc@moval.org. From road improvement projects to opportunities to learn how help first responders during a disaster to the latest businesses openings, make sure you get the good news delivered right to you inbox every Friday. The City of Moreno Valley Office of Emergency Management is holding a three-day Community Emergency Response Team (CERT) workshop from Friday, March 3, 2017 to Sunday, March 5, 2017 to train residents how to respond to disasters and work effectively with emergency responders. CERT training includes instruction in basic disaster response skills, including fire safety, light search and rescue, team organization, and disaster medical operations. Using the training learned in the classroom and during exercises, CERT members will be able to provide critical help their neighbors or coworkers during a disaster when first responders are not immediately available to help. Students as young as 16 can participate in the CERT training as long as their parent or guardian also participates. To become certified, sign up for a CERT class today! Friday, March 3 – 6 p.m. to 9 p.m.
Saturday, March 4 – 8 a.m. to 5 p.m.
Sunday, March 5, 2017 – 8 a.m. to 5 p.m.
Attendees must attend all three days of training in order to become CERT certified. The Fire Prevention Bureau, in cooperation with the Riverside County Office of the Fire Marshal, is a division of the Moreno Valley Fire Department. The mission of the bureau is to provide professional fire and life safety engineering, permitting, and inspection services for our citizens and emergency responders through exemplary customer service, leadership, education, innovation and partnership with the development and business community. The Fire Prevention Bureau has a daily effect on the community due to its involvement in the planning, construction, and maintenance of the many structures throughout the City. The goal of the bureau is to safeguard the community from fire and environmental hazards through the programs that reduce injuries, loss of life, and loss of property. This is accomplished by ensuring adherence to fire regulations, providing public education and conducting annual inspections. Any questions or comments about the Fire Prevention Bureau can be directed to the City Fire Marshal at 951.413.3370. To whom does the Fire Code apply? The Fire Code applies to all residents and businesses in Moreno Valley. Everyone must comply with its prohibitions and fire safety requirements. Residents and businesses that conduct or supervise activities regulated by the Fire Code may also be required to obtain permits that authorize them to engage in those activities. Why do you inspect our business every year? Fire Inspections are completed at least once a year to make sure the buildings in which you work or live, or businesses you visit, are safe to occupy. These inspections ensure that fire protection devices and systems are maintained on a regular basis and ready should an emergency occur. Fire inspectors also ensure that exit doors function properly, exit signs illuminate, and fire-rated walls are not compromised. What is the minimum rating required of a fire extinguisher? How often does my extinguisher need to be serviced? The rating can be found on the label of the extinguisher near the UL (Underwriter’s Laboratory) symbol. For businesses, the minimum rating for a fire extinguisher is 2A10BC. High hazard locations may require a higher rated extinguisher. In general, the Fire Code requires that one extinguisher be provided for every 75 feet of travel distance in low hazard occupancies, such as office spaces. Fire extinguishers must be serviced annually by a contractor licensed by the Contractor’s State License Board or the State Fire Marshal. Although not required, the Moreno Valley Fire Department recommends that residents have at least one fire extinguisher in the home. A general purpose, or ABC, fire extinguisher is designed to put out the types of fires typically seen in the residential setting and can be found online or in most home improvement stores. Kitchen and garage fires are the most common type of residential fire, so having a fire extinguisher near one or both locations is advised. Does my home need a smoke alarm and, if so, how many? The California Health & Safety Code requires that every single-family dwelling has operable smoke alarms that are approved and listed by the State Fire Marshal and installed in accordance with the State Fire Marshal’s regulations. Place a smoke alarm on the ceiling of every level of your home and both inside and outside bedrooms as children and older people can sleep though the loud sound of a smoke alarm. If you keep your bedroom doors closed, place a smoke alarm on the ceiling of each bedroom and check smoke alarms monthly by pressing the test button. In addition, all new construction or additions, alterations, or repairs that exceed $1,000 in cost and for which a permit is required must have a smoke alarm installed inside each bedroom as well as one centrally installed in the corridor or area outside the bedroom. For new construction only, the smoke alarm must be hardwired with a battery backup. For all other homes, the smoke alarm may be battery operated. This law also applies to multi-family dwellings, such as apartment buildings. Does my home need a carbon monoxide monitor? Beginning January 1, 2013 all single-family homes, apartments, and condominiums in California that have a fireplace, an attached garage, or fossil fuel burning appliances are required by law to have a carbon monoxide device installed. Similar to smoke detectors, you should install a carbon monoxide monitor outside of each separate sleeping area. Many detectors can serve the dual purpose of carbon monoxide and smoke detection. What is a “Knox Box” and do I need one? A Knox Box is basically a locked key box. The purpose of a Knox Box is to provide the Fire Department with rapid, non-destructive access to the property and building during emergency situations. Property owners can put all necessary keys, pass cards, and other relevant items in a Knox Box to ensure efficient, effective after-hour entry should emergencies occur. If you open a new business or multi-family dwelling such as an apartment building or condominium complex, you are required to obtain a Knox Box. In addition, the fire code official is authorized to require a Knox Box to be installed on existing buildings in accordance with 2016 California Fire Code, Section 506.1. Knox boxes are also available for purchase for private residences if homeowners would like to allow for rapid entry by emergency personnel due to a medical condition. How can I register a complaint about a possible fire hazard? If you have a concern or question regarding a fire hazard situation, you may contact the Fire Prevention Bureau by calling (951) 413-3370 or by notifying us via email at fireprevention@moval.org. The Fire Prevention Bureau investigates complaints filed by citizens regarding potential fire hazards including blocked exits, inoperable fire protection systems, overcrowding, or dead vegetation. Once a complaint is received, a Fire Inspector will investigate the matter to verify if there is a violation. A corrective notice can be issued if the situation is deemed to be in violation of what is specifically required by the Fire Code. Aesthetic issues with conditions that may appear hazardous can also be addressed by the Code & Neighborhood Services Division at City Hall. Any questions regarding the inspections can be directed to the City Fire Marshal at 951.413.3370.